Still celebrating Chinese New Year all over the world. Bring out your inner China doll and enjoy learning about these. Asian skin smoothing face & eye roller– Roll away the stress of the day and use this anti-aging treat. One side is for the eye area and one for the face. Chinese Royalty used it now so can you! Lipstain in China Doll– Stains your lips with a moist rosy glow. TEA-licious Green Tea Lip Conditioner (guys love it too) for soft kissable lips! Have you got a beauty question you’d like answered? I am here to help. Simply ask! Wok and Roll in the Chinese New Year! Shell, clean and cut the shrimps in half lengthwise. Rinse and set aside to drain. 3 tablespoons of stir fry oil. Add shrimp to wok and stir for 30 seconds until the shrimp begin to change color. Carefully remove the shrimp and not the oil and set aside the shrimp. Add green beans and water to the wok and stir around until water is evaporated. Add chicken stock and fish sauce. Add more water if necessary and add the garlic and stir-fry 30 seconds. Add shrimp back to wok and add the chicken stock and below noodles or no noodles. Whatever you prefer. Cook until pea pods are tender yet crunchy. OPTIONAL Add cooked cellophane or udon noodles and stir until coated with oil. Season with soy sauce to taste and serve. Add Hot green or jasmine tea and a fortune cookie and you will have a meal that takes you to the Orient and back. Enjoy! Chinese New Year is a 14-day celebration that starts today. You do not have to be Chinese to celebrate. My Chinese beauty secrets… Growing up I wanted Avon and Revlon…now I embrace the secrets of the Orient! Bring out your inner China Doll and stay young forever with my beauty secrets. Rice powder- to tone down shine and make makeup last longer. Pearl cream- a moisturizer for luminous skin. Green tea Lip conditioner- for day and night moisturization. Asian Powder papers-blot oil, refresh, and powder the face. 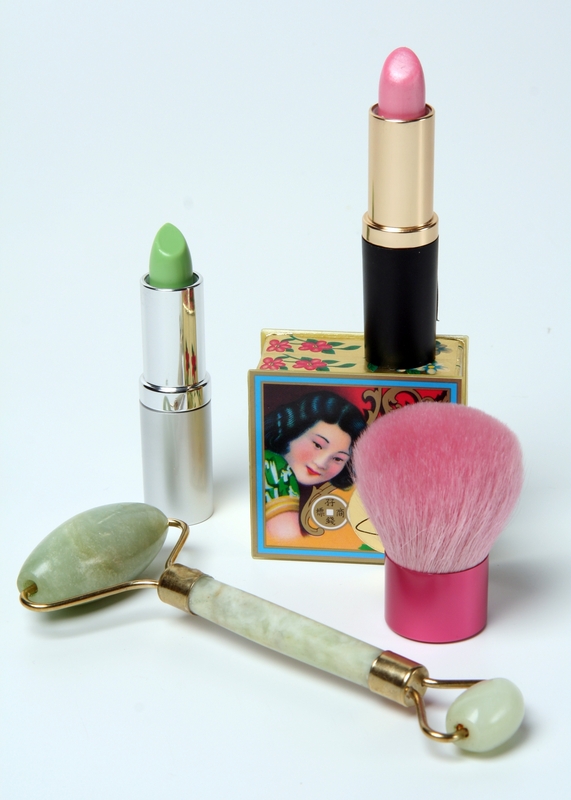 Asian Rice powder- a makeup artist and China Doll’s secret to longer lasting makeup. Green tea eye pads…apply old used green tea bags for a soothing eye lid treat. Close your eyes and smell the relaxation.